The issue of live exports is a highly controversial one, with the recent raised awareness in intensively farmed meat going some way to bring the issue to consumers' attention. Live export is a global business, with many countries both importing and exporting live animals. 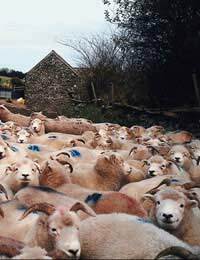 It is ludicrous that the UK both exports sheep to New Zealand and imports lamb from New Zealand - this seems to be allowed because of the different companies involved. Many businesses are either trading in export or import, so that in order to remain profitable they need to continue their trade. However, if you take a birds eye view of the situation is does not make sense to both import and export the same product, especially when that product is a live animal that faces a terrible time during the export or import process. Compassion in World Farming (CIWF) believes that live animals should not be transported for any more than eight hours, however the truth behind the live export industry is that many millions of live animals are on their final journeys for up to ten times that. The CIWF believes that animals should be slaughtered as near as possible to place in which they are reared, so the practice of transporting live animals to another country to be killed is something they are campaigning to out law. All scientific and practical evidence agrees that eight ours should be the very maximum for animals to be transported, as the journeys leave the animals exhausted, dehydrated and stresses. Indeed, the animals are often close to collapse, with some even fainting and subsequently being trampled to death by other animals in the very cramped conditions. Animals which are commonly exported live include cattle, pigs, sheep, goats, horses and chickens. The transportation methods include road, sea and rail. In the UK, cattle can be transported live from farms in Wales or Scotland to be slaughtered in Holland or Belgium - these journeys can take around twenty hours, which far exceeds the CIWF guidelines. Every year, over three million live animals are exported in the EU, with transportation times of 70 - 90 hours not being uncommon. On these journeys the animals will rarely have food or water and are often not given enough space to lie down. It is a very uncomfortable, stressful journey. Live exports from Australia to the Middle East are very common, with over six million live sheep exported each year. The journey from farm to sea port can take up to 50 hours of road transport over the vast country, with around three weeks of transport by sea afterwards. Over 75,000 sheep die in this process, with dehydration and malnutrition being the main causes. Live export also has a key part to play in the spread of diseases. The 2001 foot and mouth outbreak was further exacerbated by the Irish live calf exports and the UK live sheep exports, which spread the disease to the Netherlands. What Can the Consumer Do? If we buy our meat from a local butcher or farm shop, we can rest assured that we are not supporting the live export industry. Even by buying British meat in our supermarkets we may be inadvertently supporting this awful practice because some British animals are transported for slaughter and processing, only to be returned to the UK and sold as British produce.